Background: Diagnosing dementia in elderly immigrants is often difficult due to language and cultural barriers, low education, and illiteracy. 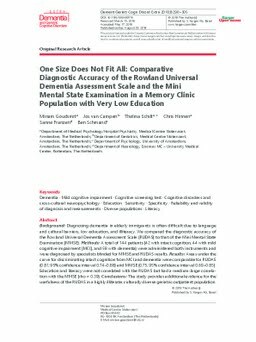 We compared the diagnostic accuracy of the Rowland Universal Dementia Assessment Scale (RUDAS) to that of the Mini Mental State Examination (MMSE). Methods: A total of 144 patients (42 with intact cognition, 44 with mild cognitive impairment [MCI], and 58 with dementia) were administered both instruments and were diagnosed by specialists blinded for MMSE and RUDAS results. Results: Areas under the curve for discriminating intact cognition from MCI and dementia were comparable for RUDAS (0.81; 95% confidence interval 0.74-0.88) and MMSE (0.75; 95% confidence interval 0.69-0.85). Education and literacy were not correlated with the RUDAS but had a medium-large correlation with the MMSE (rho = 0.39). Conclusions: The study provides additional evidence for the usefulness of the RUDAS in a highly illiterate, culturally diverse geriatric outpatient population.